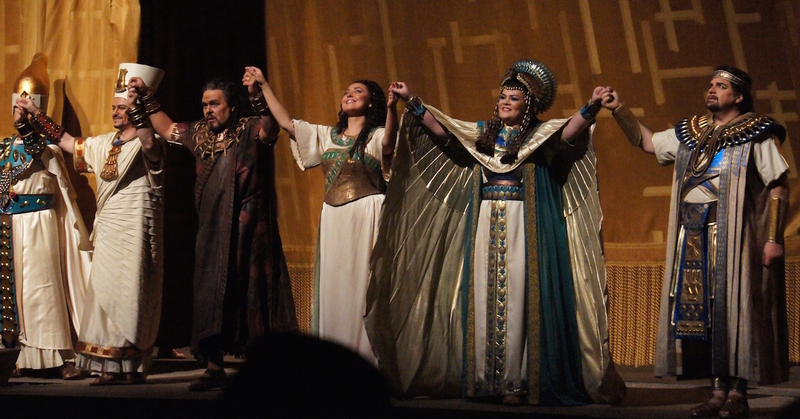 Soaring sets and grand pageantry distinguish the Met’s Aida, a production that holds up strongly in repeat viewings. 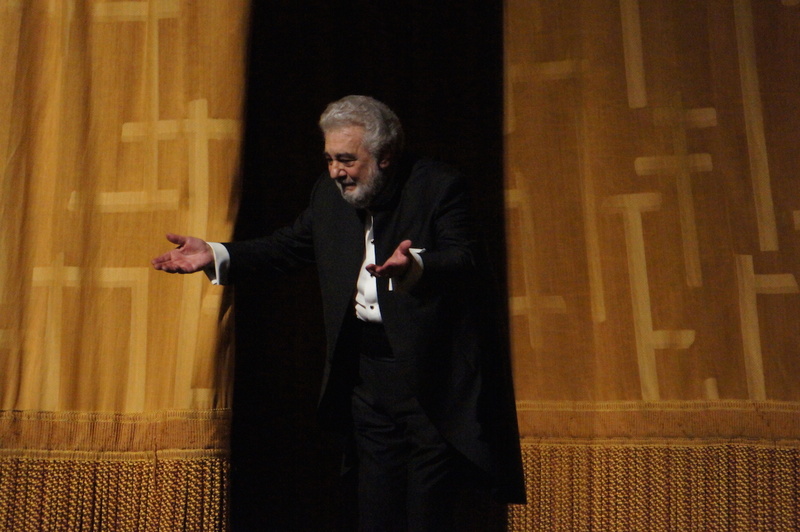 The evening began with the warmest possible welcome for conductor Plácido Domingo, the original Radamès when this production premiered in 1988. Domingo’s intricate knowledge of the music allows him to project a cheerful, relaxed vibe. His musically assured touch with the baton, draws fine, delicate playing, particularly from the strings. Marco Berti is a solid, masculine Radamès, presenting an implacable front to the brave and ambitious warrior. In “Celeste Aida,” Berti reveals a power that supports his high notes with ease, although this strength comes at a slight cost of beauty to the voice. He tirelessly maintains this vocal strength all night, but also remains rather stiff in terms of acting the role. 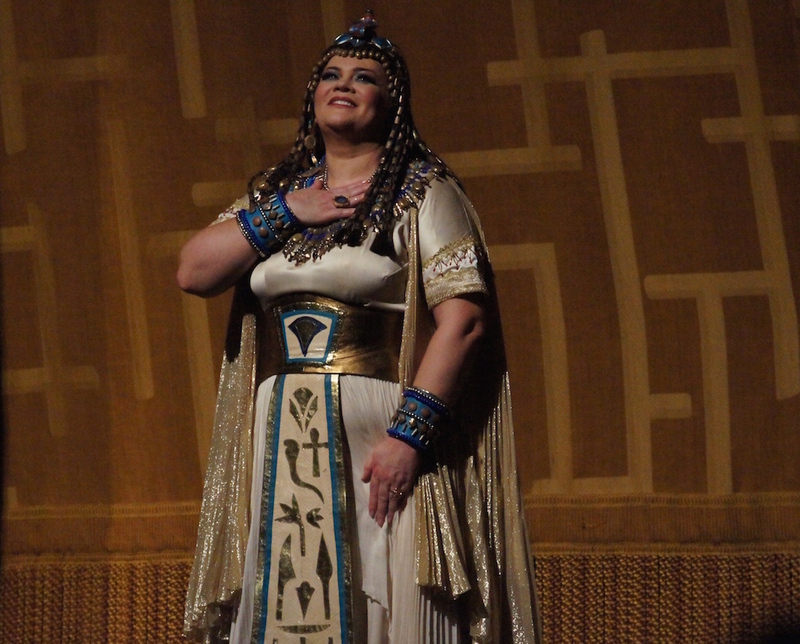 Oksana Dyka has a regal presence as the disguised Ethiopian princess Aida. She sings “Ritorna Vincitor” as a tremulously gentle prayer, her delicate volume conveying the barely contained fear of a woman who dreads the thought that her lover may not return from war. “O Patria Mia” is equally lovely, perhaps even sweeter When singing opposite Berti and Mark Delavan (Amonasro) in act three, however, Dyka’s volume is not sufficient and the character loses impact. Overall, Dyka’s exquisite vocal expression partly counters her lack of facial and physical expression, but her performance develops little engagement with the audience. Dyka and Berti display precious little chemistry as the ill-fated lovers. 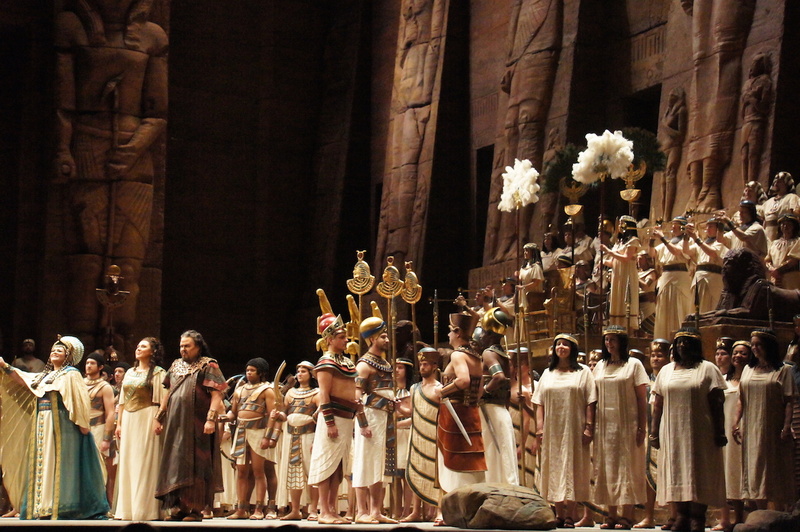 Act Two is the big showcase in any presentation of Aida, and this staging is certainly no exception. Gianni Quaranta’s set are at their most epic, with the procession in scene two lit beautifully by Gil Wechsler to give a sense of outdoor sunshine. The transition from Amneris’ apartment to the public square features a dazzling trick as the apartment sinks into the floor, bringing a phalanx of spear carriers down to stage level. A massive cast, plus a handful of beautifully groomed horses, processes in triumphant celebration of Egypt’s defeat of the Ethiopians. Alexei Ratmansky provides two impressive sets of choreography in act two. Dancers Christine Hamilton and Bradley Shelver perform a frisky pas de deux to entertain Amneris in her chambers (she is even moved to a pleasant smile). After the Triumphal March, Ratmansky presents a set of female and male dancers moving lightly and briskly in ever changing formations. This highly entertaining sequence is almost like watching the whole act of a ballet in fast-forward. Violeta Urmana sports a crafty smile as the pampered princess Amneris. Urmana has excellent projection of her mezzo-soprano, and it rings out clearly, even when singing with the entire company. As the opera progresses, Urmana goes on to give the most compelling performance of the lead cast. Her impassioned work in the final act, as Amneris awaits the judgment in Radamès’ trial, is particularly moving. Štefan Kocán displays his smooth, powerful bass as Ramfis. 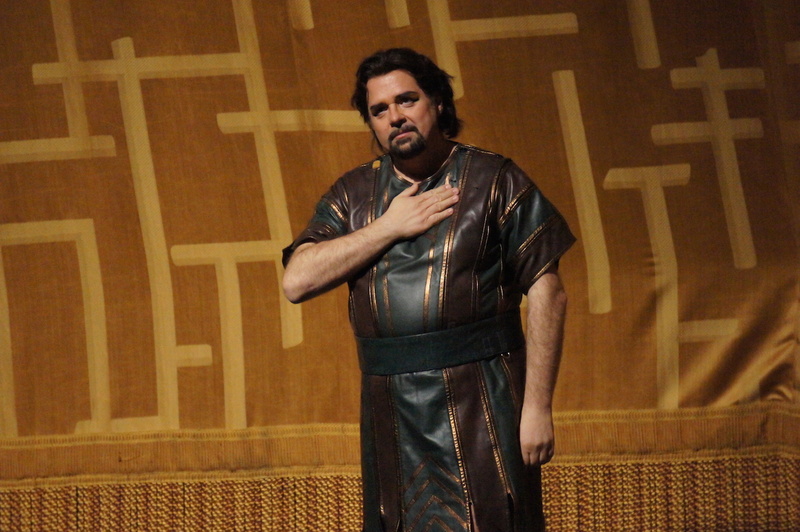 Mark Devalan adds significantly to the drama as Amonasro, imprisoned father of Aida. Chorus master Donald Palumbo has clearly made thorough preparation for the performance. The male choristers impress with their pianissimo work in act one. The loveliest of voices are heard in the female chorus at the beginning of act two, as the women keep Amneris company. Despite the excellent singing, the lack of dynamic performances creates an underwhelming experience of the drama. 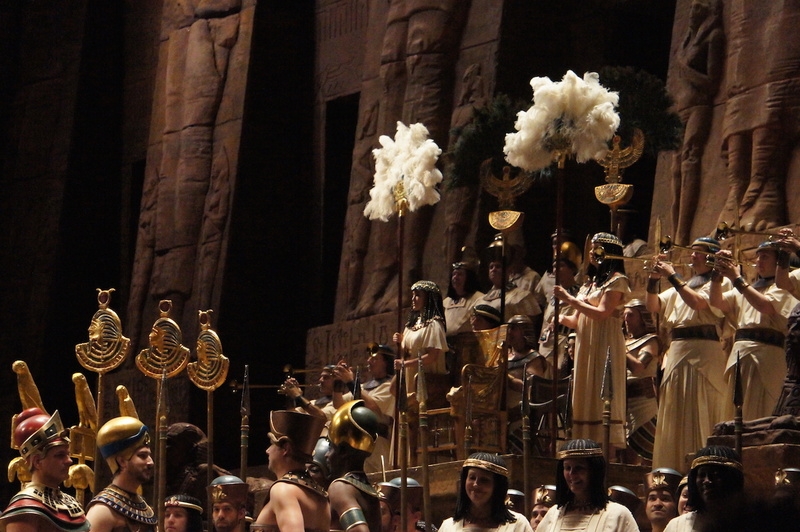 This season of Aida is mainly worth attending for the music and the spectacle. 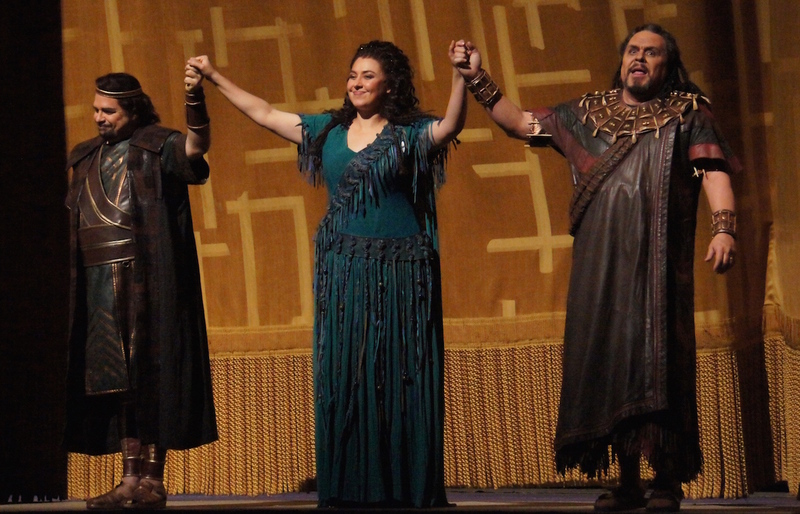 Aida was reviewed at Metropolitan Opera House, New York on opening night, 8pm Thursday 9 April 2015. It plays selected dates until 20 April 2015. 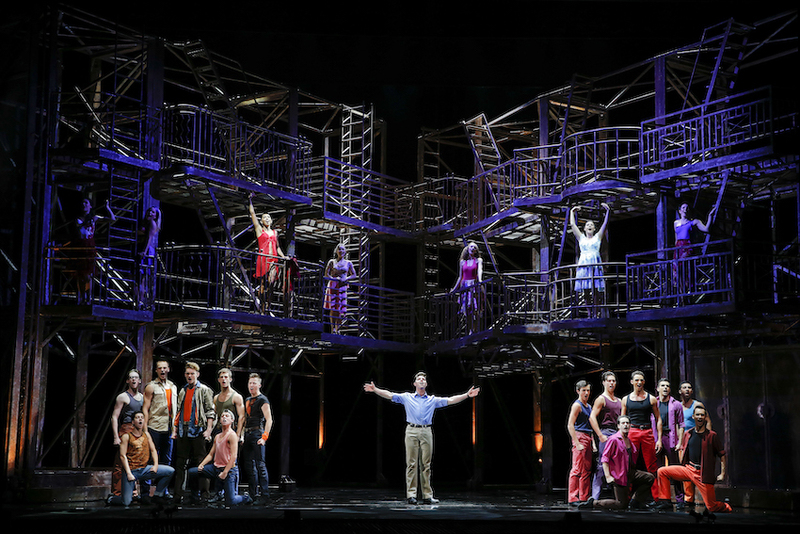 Thanks Mark, I had a fabulous fortnight in NY – such a bumper crop of new musicals this year! The number of operas was the same as last time (three). I also saw (but didn’t review) It’s Only A Play and Radio City Spring Spectacular. Hope you get into NY for a Broadway musical this year. 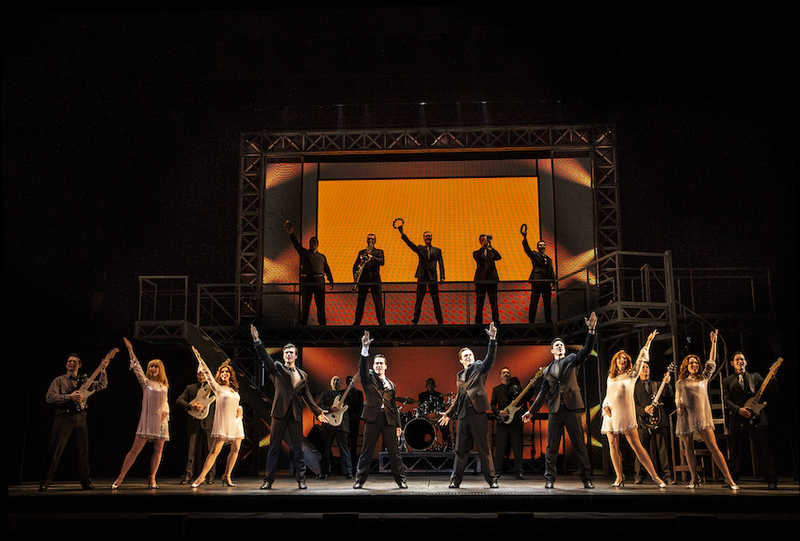 Will be watching out for a musical to be Reviewed by Mark Leonard.